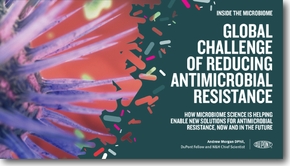 Leiden, June 14, 2017 – DuPont today announced that Dr. Andrew Morgan – DuPont Fellow and Chief Scientist, DuPont Nutrition & Health – will present on the emerging science of the microbiome and how it might potentially provide solutions to address the growing problem of antimicrobial resistance at AgriVision 2017. The conference – which will run June 13-15 in Noordwijk aan Zee, the Netherlands – is organized by Nutreco, a global leader in animal nutrition and aqua feed. Dr. Morgan will join a wide range of speakers – including former UN Secretary-General Kofi Annan – at the prominent conference in which three key themes will be explored: technology and big data in agriculture, agricultural development and strategies to address antimicrobial resistance (AMR). Dr. Morgan’s presentation will focus on the global challenge of reducing antibiotic use, looking at how microbiome science might potentially enable solutions including probiotics, prebiotics, enzymes. While the use of antibiotics has immense benefits, the effect on beneficial microbes in both the human and animal gut microbiome could pose other, potentially longer-term problems. Dr. Morgan will highlight the results of a study showing that a probiotic can help reduce the incidence of gastrointestinal disorders caused by the use of antibiotics. In the area of animal nutrition & health, Dr. Morgan will highlight how current feed enzymes and animal probiotics improve digestibility and promote animal gut health, and how microbiome science has the potential to yield future solutions to address AMR in livestock production. Follow the hyperlinks to learn more about DuPont solutions for gut health probiotics for humans and for animals. You may also download a copy of Dr. Morgan’s presentation. Dr. Andrew Morgan has over 35 years of experience in research and development, including human health & nutrition, animal nutrition, industrial enzymes and crop science as well as innovation management, business development and corporate venturing. He will be speaking during the afternoon session on Wednesday, June 14. After its inception in 2000, AgriVision has been organized biennially by Nutreco and Trouw Nutrition since 2003 and facilitates an informed discussion at a strategic level on current and future concerns in the protein food chain. AgriVision aspires to shift minds, develop new ideas, build networks and inspire approaches for the benefit of all those involved in the feed-to-food chain. For more information about AgriVision 2017 please visit www.agrivision.com.